Sure wedding rings are great -- they tell those around you that you're taken and that somebody is waiting for you at home. But wedding bands don't say whether or not you actually like the person who is there waiting for you. I found a shirt that does. 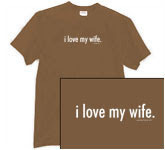 A while back I stumbled upon a t-shirt with one powerful message: "I love my wife." It's a shirt that makes most girls think you're sweet and most guys think you're whipped, but it lets everyone know that you love your wife so much you like to brag about it. And when your wife knows that you like to be in love with her in front of other people -- even at the cost of being made fun of by your man friends -- it makes her feelings for you swell a bit too. I was pretty self-conscious when I first started wearing it, and those who knew me made plenty of comments. Some guy friends said I was whipped, and both sexes asked if my wife was making me wear the shirt. But it was in those moments that the shirt's message spoke the loudest. I would simply smile and say, "Nope, I found this myself and surprised her with it." So instead of surprising your wife with flowers this week, head on over to davidnasser.com and order this shirt. It'll make your wife smile, and what husband doesn't love to see that? Definitely DO NOT order this shirt if your wife has something against brown or has ever mentioned that you do not look good in brown. Also, I have actually run into some pretty defensive husbands who see the shirt and say things like, "Well I love my wife too!" Just make sure to deal with those situations like a gentleman; build them up and say things like, "Well that's good, I'm glad." Do not instigate with things like, "Well obviously not as much as I love mine." Enjoyed looking at your blog. I hope you'll keep it up. A blog for husbands is very needed.